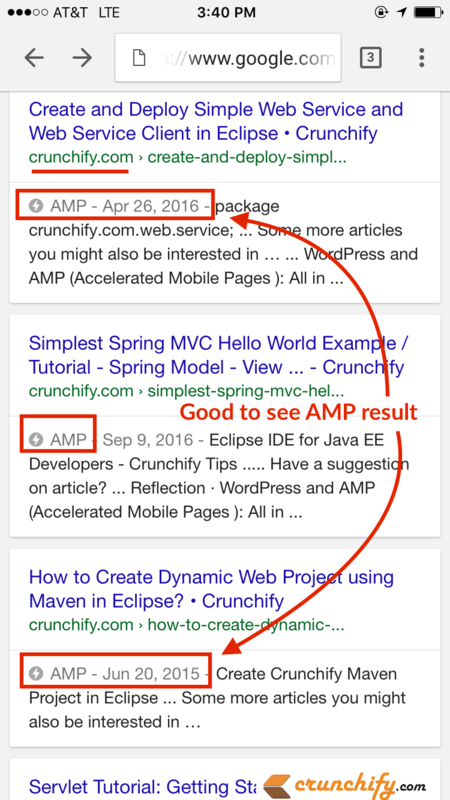 There were lots of buzz about Google AMP in recent days. Google officially announced AMP pages support as part of Mobile Search page. It’s really interesting. So far I avoided implementing AMP on Crunchify for some reason and never felt any importance of it. But after looking at Barry’s tweet I’ve decided AMPlify Crunchify too. Are you looking for AMP and wordpress tips? Do you want to AMP Up Your WordPress Site with Google’s Accelerated Mobile Pages? Or do you want to install AMP in WordPress? In this tutorial we will go over steps on how to AMPlify your WordPress site with all detailed steps. 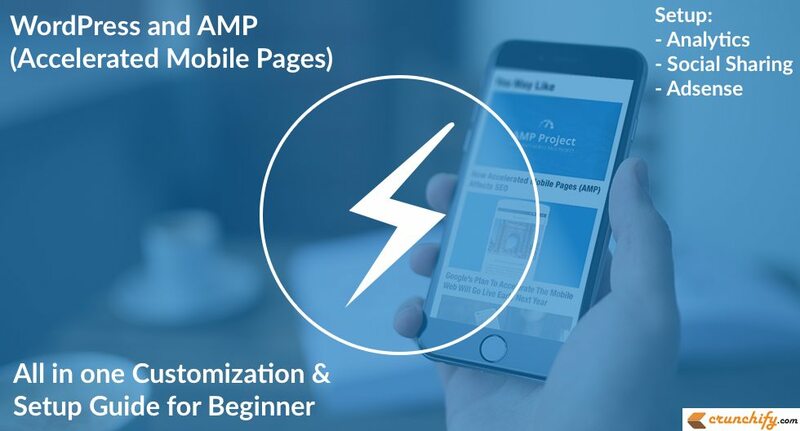 What is an Accelerated Mobile Pages (AMP)? Have any of below questions? Once activated you are all set. You wont see any option menu. You have to go to Settings -> Permalinks menu. Click Save Changes without making any changes. Official AMP Plugin provides basic functionality and all of your posts will be AMPlify automatically. You could visit AMPlified version of your posts by adding /amp/ at the end of any Post URL. Install Glue for Yoast SEO & AMP plugin. Starting version 0.4 AMP WordPress version I believe, you don’t need any other AMP related plugin. Go to Appearance -> AMP. Provide Header and Background color and click on Save. Only problem I see with this plugin is that it adds Powered by WordPress link at the bottom of page. In order to change it you may want to change footer.php page with below code. Add Analytics and Social Media icons to your AMP pages. crunchify_amp_add_analytics_social_code function will add actual your analytics code and social media icons. Make sure you update your Google Analytics Universal tracking ID and Facebook App ID below. Add Google Adsense Code to your AMP page. In my case, I wanted to add 300x250 Adsense code below featured image. There isn’t any official hook available to use so I modified, single.php file located at <AMP Plugin directory>/amp/templates/single.php. Add Adsense code as shown in below code snippet. Just look for line featured-image and add Adsense code after that. Let’s verify and check your AMP page for any issue. Go to https://validator.ampproject.org/ and check result. How is Google going to Crawl AMP Post pages? Now you have both AMP and non-AMP versions of your pages, AMP Plugin will add below relation meta tag to your both pages automatically. How to check live result? Just search for post in Google on mobile browser and you should see AMP result in Search Result Page. Also, keep visiting this page or bookmarked as I’ll keep updating this tutorial over time as per my learning. Happy blogging and help speed up the net. Hi Maria – which shortcuts are you referring specifically? There are just a few shortcuts for plain text editor in WordPress. Ctrl + c = Copy. Ctrl + x = Cut. Ctrl + y = Redo. Alt + Shift + p = Publish. Alt + Shift + f = Fullscreen distraction free writing. Well Written. But, You still need the Yoast Glue AMP plugin. It has more design options and also makes integration of analytics and all your Yoast SEO Meta Data easier. Very important if you have configured the Yoast SEO plugin. Thanks Rohit for your update. If you are using AMP WordPress version 0.6.2 + then you don’t need AMP Glue. Hi Marius. Sure. I’ll give it a try may be during weekend. Please stay tuned.